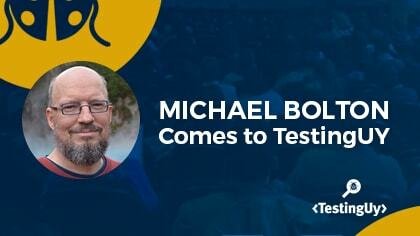 Michael Bolton is coming this May to Montevideo to deliver the closing keynote at the fourth annual TestingUY. Since it all started in 2014, Abstracta has been an organizer of TestingUY, with our co-founder, Federico Toledo PhD, playing a major role in planning the event alongside other local technology companies. TestingUY is a conference held in Montevideo, Uruguay centered on software quality, offering workshops and sessions as a two day event (May 15th and 16th) that is expected to draw over 300 attendees this year. 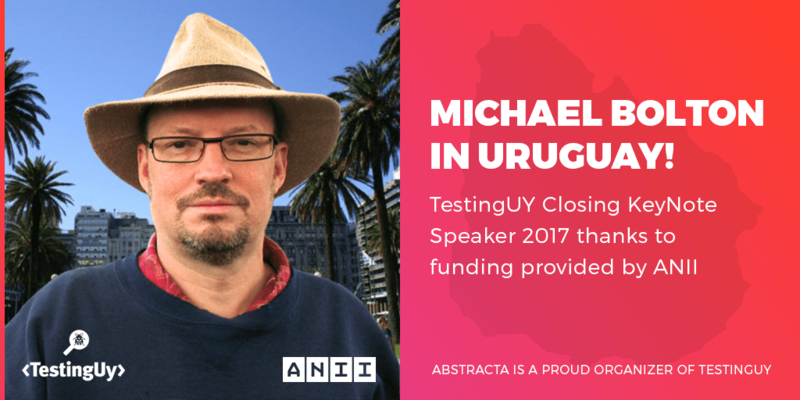 This year’s edition of TestingUY is the most anticipated of all since we’ve managed to book one of the most revered names in testing, Michael Bolton, for the closing keynote speech in which he will speak about context-driven testing in automation. In addition, during the workshops, there will be round tables where attendees can interact with him around different topics of interest, such as testing education, testing in development, agility, etc. In case you are not familiar, Michael Bolton is a consulting software tester and testing educator from Canada and the co-author (with senior author James Bach) of Rapid Software Testing, a methodology and mindset for testing software expertly and credibly in uncertain conditions and under extreme time pressure. Michael has 25 years of experience testing, developing, managing, and writing about software. For the last 18 years, he has led DevelopSense, a Toronto-based testing and development consultancy. Prior to that, he was with Quarterdeck Corporation for eight years, during which he managed the company’s flagship products and directed project and testing teams both in-house and around the world. Although few people can locate Uruguay on a map (it’s between Argentina and Brazil on the Atlantic coast), Uruguay has been growing as a burgeoning hub for all things software quality thanks in part to TestingUY, free access to higher education, government programs and support for IT, and the large quantity of startups and international IT companies that exist here. 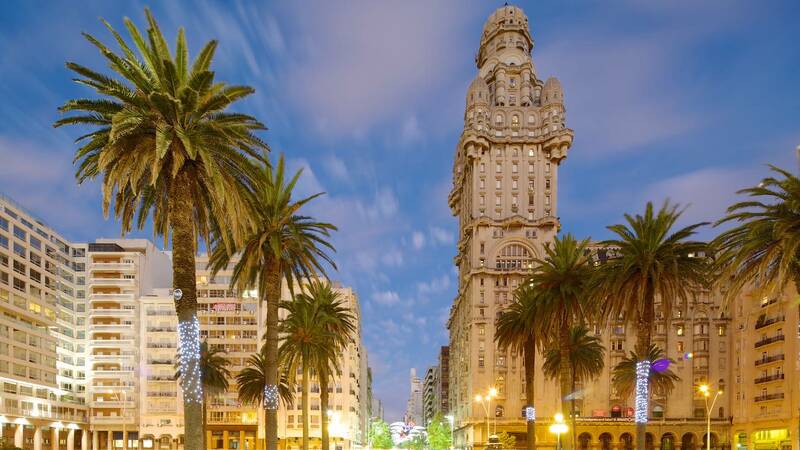 Uruguay is also one of the most prosperous nations in South America, with its capital, Montevideo ranking as the number 1 city in the continent for quality of life in a 2017 report by Mercer. Most of the population consists of the descendants of Spanish and Italian immigrants, so as you explore its capital, you will get a small taste of Europe in South America. The country year after year is recognized for its economic and social stability, lack of corruption, transparency, safety, technological innovation, and more. Lastly, Uruguay, in relation to its population, receives the most tourists out of any country in South America per year most likely due to its beautiful beaches and famous barbecue known as asado. For more information about what Uruguay is like and its tech scene, I highly recommend our recent blog post, “Uruguay: The Best Hub for QA Engineers in Latin America?”. We are looking forward to the event and hope that it helps to further raise international awareness of Uruguay’s QE hub. Thanks to ANII, Uruguay’s national agency for research and innovation, for helping to make this unparalleled advancement in TestingUY’s history possible. Will you be coming to TestingUY? The event schedule will be announced and registration opens on May 2nd at testinguy.org.